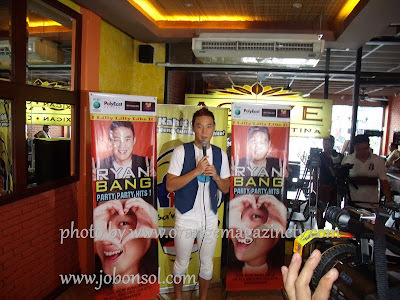 Event: Ryan Bang launches his first album, "I lilly lilly like it"
I lilly lilly like it (I really really like it). I've just attended the launch of Ryan Bang's Album at Agave Mexican Restaurant in Tomas Morato Quezon City last Thursday reminding me of my experiences with Koreans back in college. Ryan Bang (or Bang Hyun Sung) is one of the funniest talent of ABS-CBN's Showtime and a former Pinoy Big Brother Teen Clash housemate who became famous winning 2nd teen big placer in the said PBB edition. Among all stars I've met and interviewed, Ryan Bang was the most honest and translucent personality revealing all his stories and lifestyles to the media without any fear. He told us how he got to the country with his parents sending him to his mom's friend when the family had financial problems and how he struggled to audition in PBB. The intimate media album launch allowed us all to interview him personally. He shared to us all how his parents despised his singing efforts but supported him as well. 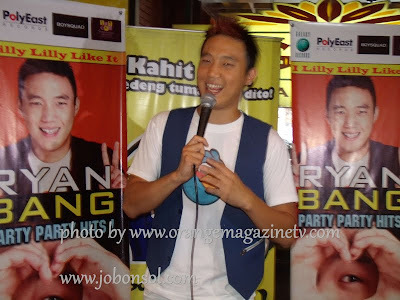 Born of a taxi driver and a simple mom, Ryan Bang exudes a very humorous yet humble personality admirable to all. He expressed his gratitude to ABS-CBN and the shows he is constantly working with at Showtime, Banana Split and 3ow Powhz. He also hopes to finish his studies soon when given the chance. I lilly lilly like it will really be famous because it's not so difficult to follow and the beat will be well-loved by every driver and commuter on the road. He is more Pinoy with his attitude and I hope that the Koreans will also vouch for him as they have revered Sandara Park of 2ne1. Listen and enjoy other songs of Ryan Bang's album, "I lilly lilly like it Party Hits" with seven tracks of today's latest foreign dance hits; Pan Americano, Parapapa, Waka Waka, Git With U and his first ever single, "I lilly lilly like it" produced by EMI Music International now available in all music record stores nationwide.